The official distribution of ChatSim World, the world's most efficient SIM card, kicks off -- ChatSim World automatically blocks data traffic with a sophisticated firewall system. Puts a stop to unnecessary costs on your mobile device. The official distribution of ChatSim World, the world's most efficient SIM card, has been kicked off. No SIM card is as advanced as ChatSim World, the world's only SIM card that can cut unintentional and undesired data traffic on mobile devices by up to 90%. ChatSim World automatically blocks, without any need for a dedicated app, unwanted data traffic with a sophisticated firewall system. This means an end to unnecessary costs on your mobile device. 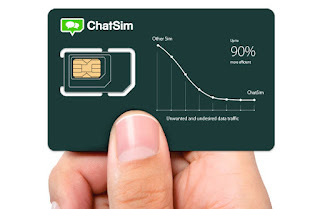 ChatSim World is an absolutely revolutionary SIM card designed for chatting faster, a more innovative version of ChatSim, the world's first SIM that lets you chat for free, anywhere, without limits, even without Wi-Fi using Instant Messaging Apps. Today ChatSim is the world's first Instant Messaging Mobile Operator (www.chatsim.com), the brainchild of Manuel Zanella CEO of ChatSim and founder and CEO of Zeromobile, Italy's first Global Mobile Operator for low-cost roaming (www.zeromobile.it). ChatSim World is the world's first SIM card to provide this innovative service without having to install apps on your device or disabling the data traffic of each app manually. ChatSim World is set to be the world's most efficient SIM card. A genuine revolution compared to all other SIM cards that let smartphones and apps waste up to 50% of the traffic included in their plans. "This problem is even more serious for travelers due to expensive roaming costs. And often users don't even know it," points out Zanella. "With ChatSim, a 250 MB data package is like 500 MB on another SIM card because all the unintentional and undesired traffic is eliminated! So the motto of this ChatSim is maximum efficiency!" proudly concludes Zanella. ChatSim World is efficient because it ensures ultrafast speed on 4G networks to exchange photos, videos at high speed. The first countries where 4G will be introduced are: Belgium, Canada, South Korea, France, Germany, Ireland, Luxembourg, United Kingdom and Spain. Coverage will be gradually extended to all other countries in the following 12 months. 0 comments on "Advanced SIM card "ChatSim World" has a firewall system to cut unintentional and undesired data traffic on mobile devices by up to 90%"